I’d read the last Ellery book and enjoyed the voice, characters and setting – it was a fun read with lots of laughs as it navigated change, choice and Christianity in ways that were unexpected and clever. Expecting another light-hearted story that didn’t bog down in an overload of angst, I’ve been back and forth with my reaction to this book. See, both of the main characters are stalled and struggling with grief, Ivy’s from the loss of her husband and her seemingly permanent writer’s block, and Gabe who is back in town after being sued by a pediatric patient’s parents, dealing with a father who sent him away as a child. Right off the bat, the ‘live nativity’ in front of the Dollar General, and the introduction to Ivy and Gabe is giggle-worthy, and gives a sense of the pratfalls to come . Ivy is still reeling from the loss of her husband to cancer, and back home in her mother’s house, a move for support both financial and emotional, has her at odds. Unable to commit words to paper, with a half-completed book due in a few short weeks, Ivy’s rather stuck – and unable to rectify the situation with a job at Dollar General, a pile of leftover medical bills and a letter from her husband that she’s yet to open. When you ad in the fact that her younger sister is also living in the house – the return to teenaged behaviors and strops is prevalent. Gabe’s story is a bit different – taking a break from his pediatrics career, he’s back in Ellery and living with the father he barely knows, having been sent to live with his aunts and come home only for summer visits. Truly out of his element and unprepared for the livestock duties, conversations with his father and his questions about Julian’s motives – he’s got a ton on his mind. 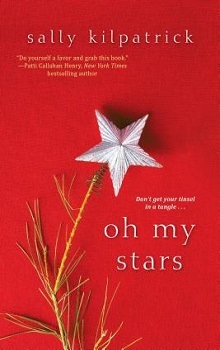 But then, apparently after one of Ivy’s many pleas to the stars, asking her husband to send her a sign, an actual infant is left in the manger a the drive by nativity – and Ivy and Gabe now have more questions and answers, and something to occupy their time in ways unexpected. And with Christmas around the corner, and Ivy’s sister suddenly having a ‘need’ for decorations and a celebration, a rarity in their household, the story soon becomes a way back to the light and a life previously unexpected for everyone. I’ll be honest and say that the dual points of view in alternating chapters also had the effect, for me, of keeping the characters a bit slow to grab onto, and Ivy was so very prickly and determined to wear her grief and the unfairness of it all like a shield and spear, that she took far more effort to understand. Gabe was a bit more open, if slow to reveal his backstory – and the bomb dropped about Julian without any real resolution just felt splashy and unnecessary to continue reader’s interest in these people in this tiny Tennessee town. While I didn’t enjoy this one as much as the other I’ve read from this series, it’ was loaded with the things that Christmas should mean: family, forgiveness, hope and a bit of unexpected miracles. Like most things in Ellery, Tennessee, this year's Drive Thru Nativity is a little unconventional. The Dollar General parking lot doubles as a Bethlehem stable, and widowed writer Ivy Long, who's been roped into playing Mary, sure as heck isn't a virgin. But then comes an unexpected development: a genuine, real-life baby left in the manger, with only a brief note. And somehow, in the kerfuffle that follows, Ivy finds her life is about to change . . . The holidays are a bittersweet time for Ivy--filled with memories of her beloved late husband and reminders that life doesn't always offer the happily-ever-afters her readers expect. So when Ivy ends up with custody of the baby, she can only chalk it up to a Christmas miracle. She doesn't know if it will be forever, but with help from family, she'll make little Zuzu's first Christmas a good one. The nativity's Joseph, aka Gabe Ledbetter, has a pediatrics background that's coming in mighty handy. In turn, Ivy is helping Gabe find his place in the quirky community. If that place turns out to be somewhere near Ivy, well, maybe this particular Christmas story will turn out to be merry and bright after all . . .
Born and raised in West Tennessee, Sally Kilpatrick graduated from the University of Tennessee, Knoxville, with a BA in English. At UT she met and married a Georgia boy. They now live in Marietta, Georgia, with their two kids. She holds a Masters in Professional Writing from Kennesaw State University and taught high school Spanish for eight years before taking a sabbatical to write and mother full time. In addition to reading and writing, Sally likes traveling, historic house tours, running, religious studies, and all things geek.